Penn Central was the result of the merger between the New York Central and the Pennsylvania Railroads. Coffee Mug featuring the newest PENN CENTRAL widebody diesel in the Norfolk Southern Railroads Heritage Fleet. Mouse pad honoring the new Penn Central Heritage diesel operated by the Norfolk Southern Railroad. 6 inch x 6 inch square green PC logo used by the Penn Central Railroad just after the merger between the New York Central and Pennsylvania Railroads. 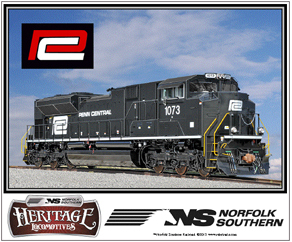 Penn Central diesel joins Norfolk Southern Railroads Historic diesel fleet. 6 inch x 6 inch square tin sign of the historic Penn Central Heritage diesel. A powerful locomotive paint scheme in Hunter Green, so dark it looks black. 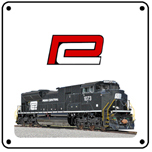 6 inch x 6 inch square tin PC logo used by the Penn Central Railroad.